Having been interested in military history since I was a boy, I suppose my view of training in ye olden times has been skewed by films portraying the leader that barks orders, treats the men harshly and simply demands they be better after breaking them down and drilling them hard. Several years ago, I worked for a naval museum and was for the first time exposed to actual training manuals from the World Wars. Generally speaking, I was shocked by the standards, methods and beliefs professed in these manuals. Contained in them are way more ‘modern’ positive and constructive approaches to instruction than I thought I’d see! Below I will share some wonderful passages from a guide for British military instructors from just before the start of the Second World War. I am sure there was still the barking that we see in films like “The Hill”, but the expectations for military instructors as outlined in this book could easily find themselves in progressive, athlete-centred coaching manuals today. And, even better than today’s coaching books that drudge on and on, it’s a 16-page book that can be accessed for free! From: Creedy, HJ. 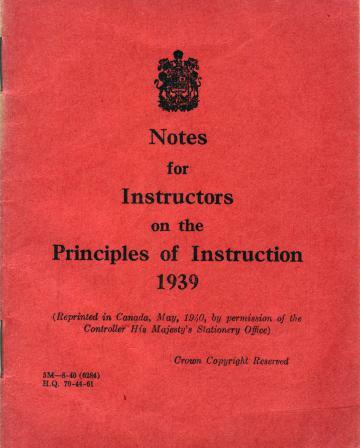 Notes for Instructors on the Principles of Instruction. The War Office. 30 June, 1939. Learner-centred instruction in 1939? I didn’t learn this concept until maybe 5 or more years into my coaching journey! “[The recruit] will learn a great deal of what is required indirectly without any special instruction. Consciously and unconsciously, by imitation of those around him, he will pick up many of the traditions, customs and ideals of the service which he has entered.” (4) I know someone who played for one of the most successful schools in Ontario who felt their success wasn’t so much due to coaching as it was peer learning and emulating the senior players who were also their mentors. “Instruction is most effective when the will to learn is present, and this comes when the recruit is interested in the work at hand. It should therefore be the object of the instructor to seek out methods whereby he can stimulate and maintain the interest of the recruits. Among the many ways of doing this are such aids as variations in the work, avoidance of over-fatigue, grading of work to suit the stage reached by the recruit, and the exhibition of an enthusiastic interest in the work in hand by the instructor himself. Enthusiasm is infectious…” (5) … taking on multiple roles, keeping things fresh, enthusiasm, excitement, having (not-silly) fun. Again, concepts only a few coaches now seem to adhere to. Non-linear learning??? I don’t think I even learned this in my teacher training in 2001! Recently I discovered a book at my local university library that, according to the authors, tries not to be a coaching manual, but offers a lot of advice and discusses their opinions on various rugby coaching matters. (Sounds familiar…) I’ve seen quite a few coaching books from the past, and some of which are quite useful even today (such as Jim Greenwood’s Total Rugby and Think Rugby which were originally written in the 1980s, if I’m not mistaken). This book, Rugby Under Pressure by Brian Jones and Ian McJennett, should be placed in that category as quite a lot of the ideas seem well ahead of contemporary thinking, and even more progressive than what I see from many coaches today, I’d argue. I’m still not finished picking this book apart, but thought I’d share some great quotes from it for you to consider, and you’ll see that these ideas from 1972 are not only insightful, but cause a certain degree of head shaking from me as they address some areas we still haven’t seen progress in. Early proponents of athlete-centred coaching? After reading these passages in the first few chapters of a book that was published back in the 70s, I felt as if the majority of the rugby world really hasn’t progressed that much in 40 years. There are signs of light, however, especially given how dominant the All Blacks are these days playing open rugby where everyone is capable of carrying / moving the ball and making smart decisions. Hell, even South Africa have been passing and running more this year than in the past as have England under Stuart Lancaster. Other teams, however – and, sadly, this includes the once-flashy French and Welsh – are playing a predictable style of play that aims for brawn over finesse. For us at the amateur level, there’s a real danger in this as we tend to copy what we see the ‘top’ nations doing on TV. I think Jones and McJennett’s other messages are important reminders that we need to know our teams – and not just their abilities / limitations – but what THEY want to get out of the season, not just do what we tell them to do. It should always be about them – having fun, learning, growing, trying new things and having even more fun because there’s a knowledgeable and supportive person helping them along the path, not directing them where he/she thinks they should go. My apologies to those of you who follow this blog for not making a post in several months! I’m in the final states of completing a Masters degree and didn’t make much time for blogging in between school work and lots of cycling. It’s a new year and I’m in a new location, with a new club, so in the spirit of ‘newness’ will be posting – hopefully many – new articles over the coming weeks as we start indoor training. I want to kick off 2012 with something that would have been more timely posted in October – my thoughts on the Rugby World Cup. Despite the time lapse, however, I think the following things which struck me can be lessons on how I’ll approach coaching in the new year – affirming some of my beliefs and giving me new things to think about. I hope some of the bitter sorts who think New Zealand’s win was undeserved, and who unfairly lobbed a lot of criticism at the referee, have had a chance to cool down as I believe they were truly justified as winners. Not only because they had the players – and back-up players! – to do the job, but because their preparation for the tournament is what – in my opinion – got them there. 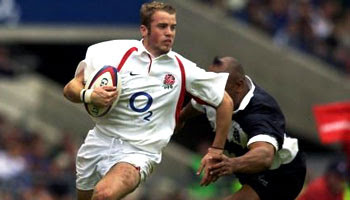 I’ve just recently finished reading Clive Woodward’s book, Winning!, on how they won the 2003 Rugby World Cup. In it, he outlines all the structures put in place in order to instil both a winning culture within the minds of ALL people involved with the team, from coaches, to staff, to players, to the wider training group who didn’t make the cut. He also underlines the importance of infrastructure in supporting everyone’s needs. I’ll talk more about this later when I synthesise my notes on the book, but it appeared to me that Graham Henry followed that same sort of mentality. Clive talks about surrounding himself with the best staff and players and developing a culture of winning, and that is something that was obvious within the All Blacks over the last two years or so. Assistants Hansen and Smith are top notch, and they all seemed to contribute, even switching roles at one stage. That, to me, shows a team that is truly functioning within. They also have maintained pretty much the same core of players for the last few years. Others have been tried and those players put pressure on the incumbents to do better. Those who earned their place – like Piri Weepu – were rewarded, though there was immense faith placed in the old guard – like Ali Williams, only recently having come back from his Achilles injuries. Like England was between 2001-2003, New Zealand have been virtually unstoppable over the last two years, and any bumps along the way only served to teach them lessons and make them stronger. (Anyone who remembers how they exited RWC 2007 and survived the 2011 final, with many of the same players, can see how they grew.) The lesson here is that team culture, coaching structure, and total club buy-in is immensely important, and I believe can even elevate teams beyond those who are arguably better on paper. If you want examples of great traditional half back play, however, watch BOTH Japanese 9s (Fumiaki Tanaka and Atsushi Hiwasa), and their partnership with fly half James Arlidge. To me, they were the best in the tournament – ever-present at the break down, and with speedy, accurate passes. Some teams, like England and Australia, have great 9s who can make little darting runs, but they were rarely effective doing so as international-level defences are incredibly focused around the ruck. When they did, it also left a ‘slow ball’ situation at the next break down because their passer was trapped at the bottom of it. When I talk about the “9 1/2”, I’ll examine how such a team needs forwards to be decision makers and/or passers to make up for that. The Japanese, however, were always on-hand to make the pass and did so without delay, hitting their forwards on the run, rather than relying on the static pod system a lot of other teams use. This not only accounted for their relative lack of size, but also kept defences from getting organised, providing Japan with a lot of ‘go-forward’ ball and opportunities to make things happen. I’ll definitely be focusing on this in the new year, and maybe a combo of both styles if the team is receptive to having the forwards pass more and, essentially, playing with two decision makers in attack. I made a note to discuss ‘game changers’ months ago because CBC radio was doing a series on people who did just that around the time of the Rugby World Cup. I made a note to discuss both the South Africa / Samoa game and the Ireland / Australia shocker. Unfortunately, I’ve forgotten much of the specific details of both games, but do remember the important parts. Simply put, both Samoa and Australia went into half time with a major hurdle to over-come. Samoa were down 0-13, but were playing well and – as they often do – were intimidating in the loose and had weapons all over the park, in both the forwards and the backs. Australia were definitely the better team on paper, but the Irish are a clinical and powerful side and were bullying the Aussies, who are more open field flair and less about playing the gritty tight game. Both teams emerged from the changing rooms at half time with contrasting mentalities from each other. I’m not sure how much of it was down to coaching decision / in-decision or by the players themselves deciding to step it up / not, but Samoa came out firing and won the second half 5-0, while Australia kept doing the same old thing and ended up scoring no points. Both teams lost, but one would have expected that from Samoa – who could have won the game, while Australia should have beat the Irish. The difference was, I think, in the decision to make a tactical change / affirmation / clarification at half on the part of the Samoans. They identified their strengths versus the areas the South Africans were looking weak (from memory, I think it was the midfield – in particular, they used a simple loop to beat the Fourie’s blitz, and slipped inside him for their try). They matched their muscle and kept the South Africans on the back foot and denied them possession. Conversely, again from memory, the Australians kicked away a lot of their possession and continued to try and muscle up to the Irish, getting bullied in the process via their rugby league style defence. I’m a huge fan of Aussie rugby, and kept wondering why they weren’t trying to play the game wider as a few forays into that territory yielded in positive results – but then they’d go back to kicking away the ball and trying to do slow drives in tight with outmatched forwards. The lesson is to be analytical during the first half and not to be afraid to make a big change of strategy, tactics, or personnel at half to capitalise on anything learned. I’d like to think that any good backrower should have the skills Smith has – the ability to be tenacious on defence, going to great lengths to win the ball back (legally, but sometimes not – Richie McCaw has said that a keen defender needs to always be on that edge to play to the referee’s interpretations – and whistle – so he can steal the ball, or at least disrupt the opposition). For me, it’s hard to separate Smith and McCaw when it comes to who’s been the greatest ‘openside’ ever, though I want to give it to Smith because he is, as you saw in the video, quite capable of the spectacular. As such, what I think also separates the openside flanker from the other backrow players is their ability to link with the backs. It should be noted that these guys are often the fastest and fittest of the forwards because they’re the ones who’re chasing the ball all day, ‘open side’ referring to being on the side where the fly half and the bulk of the backs are aligned. Using that speed and quickness, and hopefully a sense for space and continuity such that backs possess, a team should be able to count on an openside flanker to be an extra weapon in attack. That Australia and New Zealand have such wonderful attacks, and a number of flankers which play like this is definitely not a coincidence. I don’t have to keep talking about Smith as the evidence of his brilliance is in the highlight video. I still have dreams that he’ll say his retirement was all a ruse and that he’ll be in the Wallaby back row, alongside the brilliant defender David Pocock, for the upcoming World Cup, but I guess I’ll just have to watch more Toulon games until he finally calls it a day. With regard to selecting your openside, though, it can definitely be a job for that player who’s got a bit of ‘mongrel’ in them, as the Aussies say – that someone who’s more spirited, more aggressive, and more enthusiastic than anyone else. (It’s often a good job for that little, nuggety tough guy/girl who’s possibly got a Napoleon complex!) But the two things I’d stress – though it’s good for any player to have – is supreme fitness to always ‘be there’ when it counts, and to have the ability to run and pass the ball with intelligence. These players can be your extra backs in attack and defence (covering, as many do, for poor defending fly halves), or be the inspirational forward who puts his or her body on the line to win a crucial steal in the tackle contest. I’ve been pleased to see that rugby is still a game for all shapes and sizes over the past few weeks as France ran and passed their way to a Six Nations Grand Slam (i.e. defeated all challengers from the UK, Ireland and Italy) with a finely balanced team. After Aurelien Rougerie injured himself in the match against Scotland, we got to see living proof that there is still room for the little man in rugby with coach Marc Lievremont’s faith in his wingers. Standing at just 5’9″ and an un-heard of in the modern era 5’5″ respectively, Alexis Palisson and Marc Andreu proved that so long as you can play defence and be a threat in attack, it doesn’t matter how big you are. Critics, like former Irish international Tony Ward, believe that with players getting bigger rugby needs to adopt League’s lesson and remove two players from the field to open up space. Rather than suggesting dropping players, I think the onus is on the entire rugby community to continue focusing on developing excellence in basic skills and game awareness to make this space available or create it. There are plenty of teams which show this … again, I have to cite the French and Crusaders/Canterbury (and will go wash myself clean in a minute) … that you don’t need to have teams full of massive blokes to be successful, and that by simply ‘playing rugby’ as it was meant to be played can still allow you to win the day. Critics could argue tiny Christoph Dominici’s lesson in wing play delivered to Lomu in the epic 1999 World Cup upset as a one-off, but I knew the era was coming to close when the Canuck cheat sheet answer to Lomu, the 6’6″ Justin Mensah-Coker, was taken to school in a Churchill Cup match by comparatively smaller James Simpson-Daniel and Richard Haughton. If you want more proof, look at the day the day James Simpson-Daniel also proved that big wingers just don’t have the lateral movement to match a speedy little guy? As have continued to say over recent years: If you’re good enough, you’re ‘big’ enough. The old (tired) adage about rugby states that it’s a “barbarian’s game played by gentlemen.” Since learning the history about the game’s Public (i.e. independent) school roots, and how most if not all schools adopted it to instil desirable virtues into the minds of young men, I really think it’s a ‘gentleman’s game played by gentlemen.’ Incidents such as this are always great to see as they existed in the past, still do at the lower level in the minds of traditional rugby referees, and hopefully they will never cease. Remember the ‘Good Old Days’? Taken from: “Cornerposting, and other ancient aspects of the game,” a discussion topic on the Planet Rugby Forum. The defensive number 8 pulled his head out of the scrum, and ran directly towards the open side cornerpost. The tight forwards on the attacking side ran directly towards the goal-posts, in position for a centre kick. A good forward pack stuck together, you could “throw a blanket over them”. A forward would never, ever, get caught up in an attacking backline movement, or risk being labelled a “seagull”. We stayed on the field at half-time, and sucked oranges. Tries were originally nil points. They merely gave the scoring team a place kick at goal. That’s why it is called a try. Leather balls which doubled in weight when it rained. Only the French had the ‘cool’ adidas balls, and only the French used spin passes. Jockstraps (athletic supports) also. Shoulder pads, if you could get away with it. Kicking directly to touch….from anywhere. Scores like 0-0 and 3-3 in Internationals. The Times rugby scores still described a converted try as a “goal”, worth five points. An unconverted try was shown as a “try”, worth three points. There used to be no gaps in the lineouts and and no lifters. Jumpers used to jump across the lineout, using elbows and fists where appropriate, and the ball was generally slapped back. 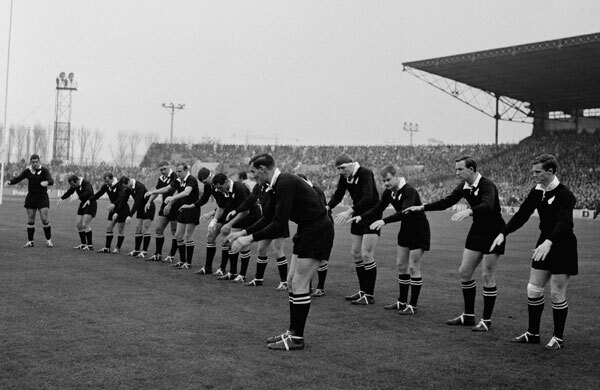 The opensides always stood at the back of the lineout with their hands on their hips. Boots that covered your ankles and had toe-caps. You laced your boots three times round the outside to keep them on. You could take a mark from a kick anywhere on the field, and have the free kick, but had to call “Mark!” at the same time as making an actual mark in the ground with your heel. 2-3-2 scrums with ‘wing forwards’ that hung off the side, a precursor to the flanker of today, which were called a ‘wing forward’ until not too long ago. The lock was the man in the middle of the back row (3-2-3 scrum), now referred to as No. 8 in a 3-4-1 scrum. Front rows binding, crouching and engaging all in one fluid movement (yet, still managing to stay up), often before the backrow has bound on. Substitutes were ONLY used in the event of injury. Until 1954 you had to play the ball with a foot after a tackle. Even when the ball was visible just inside a “loose scrum” or ruck the scrumhalf had to “hook” it out with his foot before he was allowed to pick it up. Loose scrummages and set scrummages. No “rucks”. And a maul was a specialised struggle for the ball in in-goal. Rucking, as in using the boot to create quick ball. Or to boot the s*&% out of the opposition if they were slowing it down. International players would meet up on Saturday morning the day of the match. 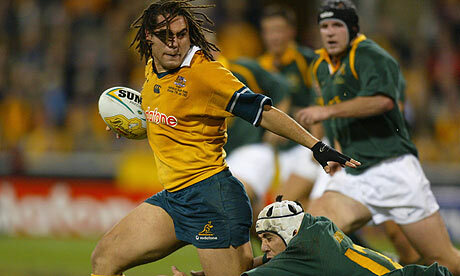 Australian teams were numbered the opposite to today, the front row were 15, 14, 13, through to the fullback who was 1. (Rugby League is still like this.) Several UK clubs wore letters on the backs of their jerseys until the late 90s. Shirts didn’t have sponsors on them because rugby didn’t turn pro until 26 August, 1995. Hakas were nothing like what they are today, and looked more like pat-a-cake! Trainer’s role largely being restricted to applying the ‘magic sponge’ to an injury. A simple scissors move bamboozling defences. Making your own tee from the turf – four nice big heels, or later a bucket of sand for the kicker. (Andre Pretorius only recently stopped doing this, I’m told.) Place kicks was taken from a straight run-up and kicked with the toes. 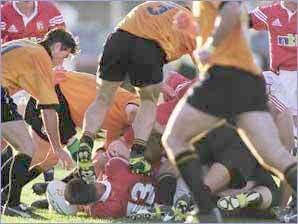 Tackles executed by grabbing a player by the collar and whiplashing him to the ground was common practice. There are some more cool history tidbits here: Rugby Pioneers Blog and the Wiki History of Rugby Union. 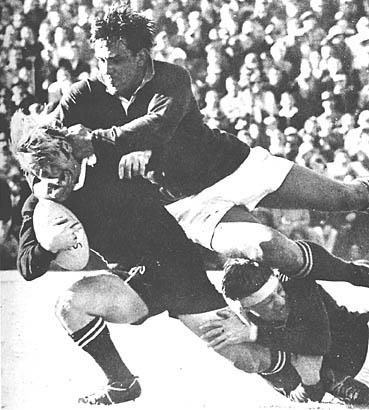 If you want a nice quick read as well, look out for 60 Years of International Rugby by Peter Bills or J.J. Stewart’s rare Rugby – Developments in the Field of Play (or borrow it from me! ).